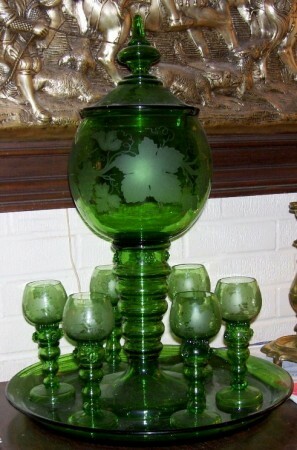 All blown green glass wine serving group with matching tray. The serving bowl is in the form of a Roemer too. I do not think this is Theresienthal, however I don’t know who made the set. This set might be rated a 5 (Uncommon) on the Smith-Paratore rarity scale. These steins, vessels, etc., etc., were all seen ‘here and there’ on “The Virginian’s” travels through my now 41 years of collecting. A third of a liter, deep diamond cut, mouth blown glass stein. Excellent looking within the light! It comes equipped with .830 silver lid, and the marks are from Belgium. Circa 1920. A very attractive piece and probably given to a horse rider, or horse farm owner. This stein might be rated a 5 (Uncommon) on the Smith-Paratore rarity scale. 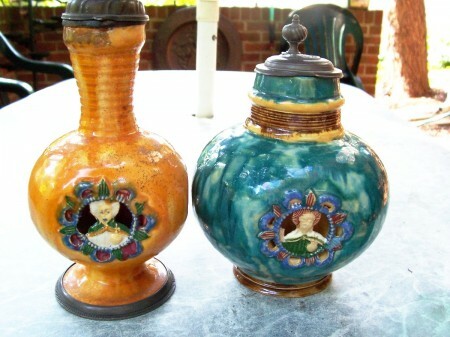 Hard to find, and sometimes pricey when they are, both of these are from the “Munchener Werk-Stadt,” which was in business making Hafnerware (has a lead glaze) type steins in the early 1920’s in Munich. There is a niche behind the Religious beings faces. I believe the one on the left is a prototype, therefore possibly one of a kind. It came with a small amount of damage. These steins might be rated a 5 (Uncommon) on the Smith-Paratore rarity scale. 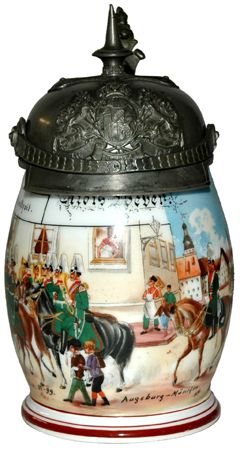 A half liter porcelain Bavarian reservist’s stein with a total body wrap around scene; a decal with painted touch up. The molded pewter helmet lid is seen not too often and adds a great amount of class to this piece. However it is not very practical to drink out of this piece as the lid make the stein want to tip over as it is so heavy. Dated 1897-99, (an unusual two year service time, as cavalry soldiers were in the service for three years.) [NON FWTD] This stein might be rated a 6 (Scarce) on the Smith-Paratore rarity scale. A jewel encrusted silver “Mate Cup” (not the kind of drink one now gets at Starbucks, that is Latte.) Made in South America in the late 1600’s, from a hollowed out calabash gourd, and with great Spanish colonial silver work. These are now being collected and used as decorative / status “wine cups” here in the USA. Six inches tall. This “wine cup” might be rated a 6 (Scarce) on the Smith-Paratore rarity scale. A 2 liter, 14 inches tall mouth blown cranberry glass serving stein, with a clear handle, a small “kick” and a “shoe horn” thumblift. 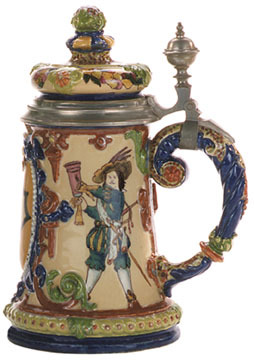 This unusually shaped stein was made in Bohemian about 1840. This stein might be rated a 5 (Uncommon) on the Smith-Paratore rarity scale. “The Mother of all ‘Westerwald’ wine jugs.” mADE BY r. HANKE Circa 1880, it stands 31 inches high to the top of the handle and is so heavy I doubt if it was ever used for serving! A few years back there was a big discussion amongst several of us, using Prosit as the vehicle. The question asked was: “What was the use, if any, of the large ring in the grotesque’s mouth?” At that time I proposed the use of a towel draped through it, to keep the wine from spilling on any well thought of table / tablecloth. Still a good idea I think, but then I wondered where did the design of “anything” having a big ring in its mouth come from? In reading a book about medieval bronze works, I believe I found where the idea originated. This extra large wine server might be rated a 6 (Scarce) on the Smith-Paratore rarity scale. Heavily enameled cranberry colored glass pokal with a clear glass finial.It was probably made by “Meyr’s Neffe”, in Bohemia. It has applied colored glass beads all over the body with none missing! It stands sixteen inches tall. This pokal might be rated a 6 / 7 (Scarce plus) on the Smith-Paratore rarity scale. 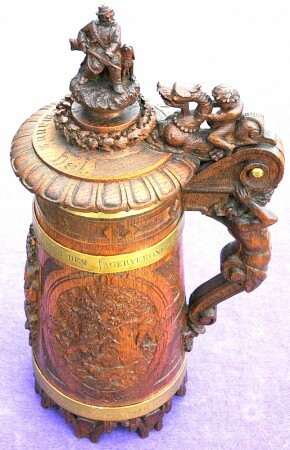 This 17 inch tall very well carved wooden stein from Germany. It was bought by an eBay buyer (I wasn’t even close) for about $90 an inch back in mid December of 2010!) It had several minor things wrong with it. The child riding the sea horse is a great touch, as are the hunting scenes on the sides and the armorial on the front. One might rate it as an 7 (Very scarce) on the S-P Rarity Scale. 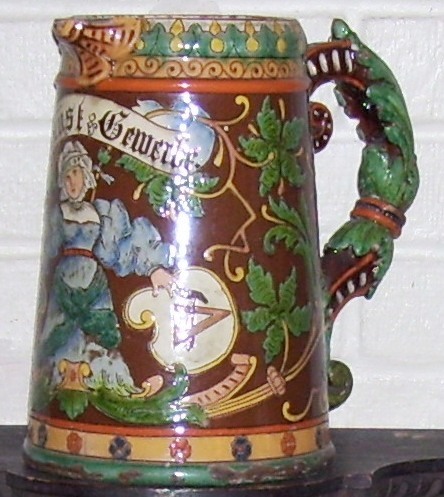 One liter German fayence beer stein. I think Bayreuth. Circa 1790. 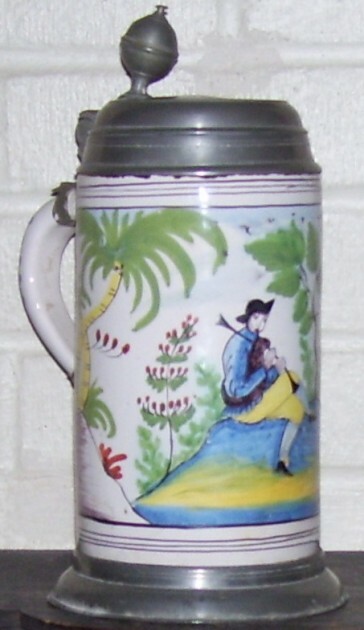 I have recently searched my entire 40 year accumulation of stein sale catalogs (in the high 100’s now) and never once have I seen a German bagpiper on a fayence stein! (Updated June 2013. I have now seen two others still a scarce subject matter. My friend and fellow collector Bill Hamer shows none in his list of fayence stein subjects. (For a massive file on fayence (faience) and the scenes to be found and the number of them, by factory, and this is for serious students of fayence only! Then please email my friend William Hamer at: [email protected]). One might rate this stein as an 7 (Very scarce) on the S-P Rarity Scale. 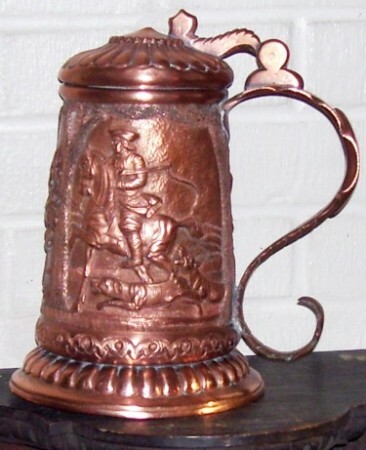 A very heavy one liter copper relief beer stein probably from the region around or in Hungary. Circa 1840-60 .Very nicely done relief body work and “Double C” handle strap work. This is another one I have not seen anything else like in 41 years of collecting. This stein might be rated an 7 (Very scarce) on the Smith-Paratore rarity scale. A half liter porcelain stein made by the “Ginori” porcelain factory in Italy, about 1820. For more information please see the article at this web site, the Tab is: “Silver Drinking Vessels” (Tale Number One.).. http://www.steveonsteins.com/silver . Because of it being a Ginori, and not the old “Crapo-de Monti” one sees all the time, this stein should be rated a 7.5 (Very scarce ~ plus some ) on the Smith-Paratore rarity scale. 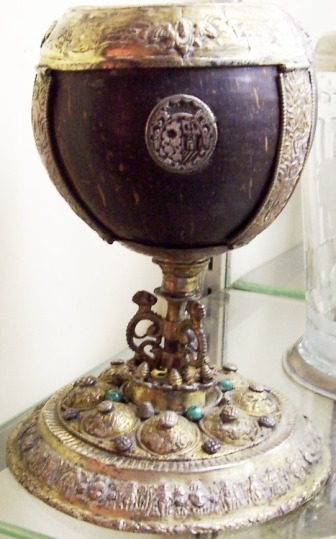 A “bronzed” or copper mounts over blown “milky” Opaline glass. This design has also been seen in ruby with a silver plated overlay, and in other glass colors. Probably Austrian. Circa 1860’s. This stein, especially with this color glass, might be rated a 7 (Very scarce) on the Smith-Paratore rarity scale. 15.5 ht., enameled shield with crest, a very nice pewter lid with dwarf finial and thumblift. Made by Anton A. Egermann, Haida, Bohemia. Circa 1890. 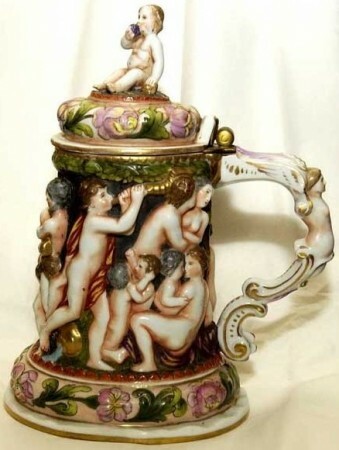 This stein might be rated a 5. Uncommon – highly collectable – seen in U.S. stein auctions every 2 to 3 years. 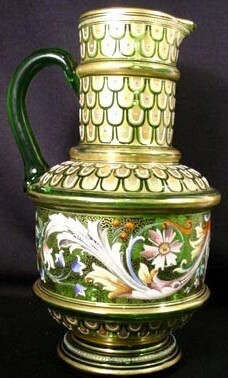 A one and a half liter, majolica beer stein, most probably Austrian . Enameled relief scenes of Lansquenets drinking. Circa 1880. [FWTD] It is in excellent condition having no dings, which is rare on majolica pieces. This stein might be rated a 7 (Very Scarce) on the Smith-Paratore rarity scale. 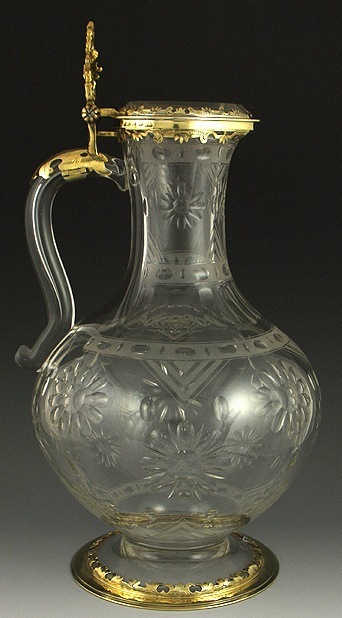 An 11 inch tall, blown, circa 1850’s green glass roemer with layered base, with additional decorations of silvered background, gold highlighted round prunts, flat enameled prunts, enameled white dots, frosting, a gold painted serrated glass on a glass rope ring around the neck and damn near every other form of decoration available at the time. One of a pair! Probably Josephinenhütte or Myers Nef. These pieces should be rated a 7 (Very Scarce) on the Smith-Paratore rarity scale. A North German pewter “Roerken.” A 9.25 inch shooting prize from the city of Magdaberg, engraved with the winner’s name and dated 1673. [FWTD] Older pewter Roerkens such as this are “super collectable” in Europe, as are old marksmanship trophies. This stein might be rated an 8 (Rare) on the Smith-Paratore rarity scale. 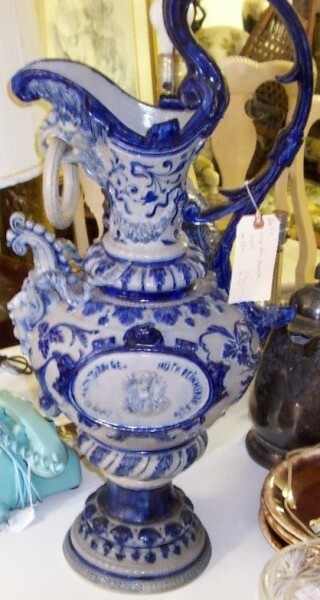 An Austrian Majolica Jug standing a whopping 10 inches tall. [FWTD] This piece was the “Jug of the Guild (Zunftkanne)” for an (stage) artist and set construction guild. Circa 1880. There are matching 1/2 and 1 liter Guild Steins that could have been ordered at the smae time or even later, one has been seen dated 1888. 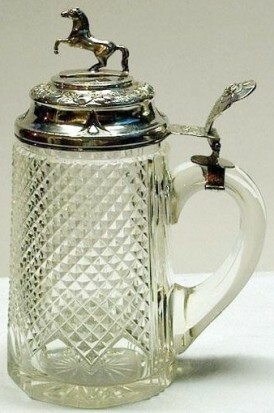 While this is a unique serving stein with lots of “show”, one might rate it as somewhere between a 6 to 7 (Scarce plus) on the S-P Rarity Scale. 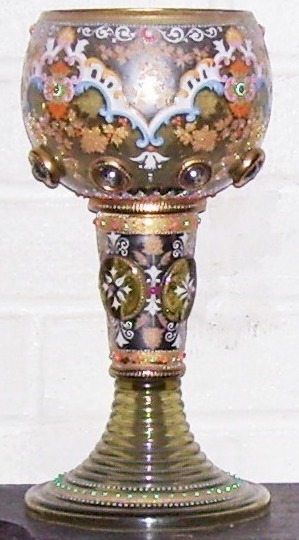 Left and right: Two Italian Bronze pokals with enameled armorials on the front and an enameled Gothic trophy design on the rear. These are placed so that they show in the windows made in the bronze overlay pattern. 20 inches tall. 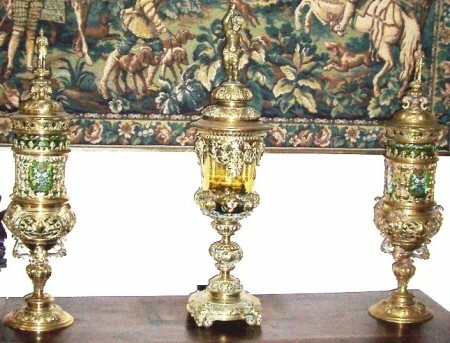 The center piece is an Austrian bronze pokal, 23 inches tall with the glass body made by Theresienthal having their famous gold edged flowers as the design. The pair of smaller pokals might be rated a 6 (individually) on the Smith-Paratore rarity scale; and the middle, the larger one, an 8 (Rare) on the scale. The “Smith -Paratore Rarity Scale” has been reprinted here – excerpted from this web site’s page which explains it’s intent and use more fully. 1. Garbage – yard sale or flea market material. 2. Extremely common– used to decorate bars or windowsills or as gifts. 3. 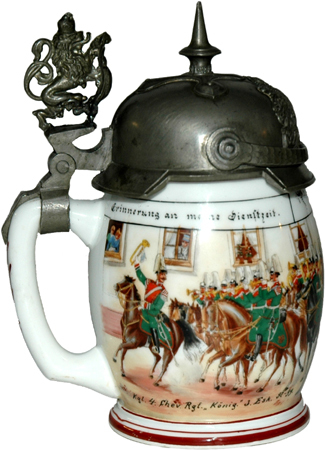 Very Common– seen in every or every other stein auction – beginning stein collectables. 4. Common – seen fairly often (at least once a year) in U.S stein auctions – collectable. 5. Uncommon – highly collectable – seen in U.S. stein auctions every 2 to 3 years. 6. Scarce – seen in U.S. auctions once every 3 to 5 years. 7. Very scarce- seen in U.S.auctions once every 6 to 10 years. 9. Very rare – best of its type = “Capstones” in major (World Class) collections. Also one of a kind steins. Local or regional museum quality. 10. Extremely rare – others like it seen in the major museums. Masterworks of art!